my name is jonathan; and i stalk people on social media. don’t look at me in that tone of voice. you do the same thing. we all do. it’s one of the beauties of the internet. we can find out most of what we want to know about all of those random people from high school without them ever knowing we’ve been snooping in their life. it’s beautiful. and i’m not afraid to admit it. i was on instagram one day scrolling through pictures and happened to notice a name i hadn’t heard in years. she had either commented or liked a picture. that’s when curiosity got the best of me. what’s she been up to? where does she live? how awkward would it be to randomly start following her? lucky for me, her profile was public so i was able to sneak a peek and answer all of those questions. have you ever stumbled on something small and mundane that somehow ended up sticking with you for a while? 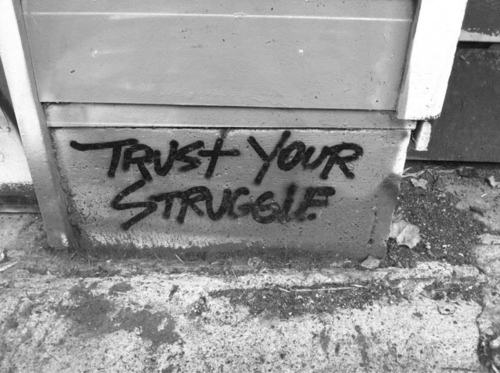 that’s what trust your struggle was to me. it became something that kept popping up in random conversations. as i thought through things at different times, trust your struggle seemed to make more and more sense. last month i was at a conference and i heard a pastor give a small 15-minute talk. i’d never heard of this guy before and he wasn’t one of those typical big name celebrity pastor conference speakers. as he was talking, he told the story of how his friend came up to him and said he’d been struggling with something in his life. the pastor surprised him when he responded by saying that it was awesome he’d been struggling with the issue. confused, his friend asked him why it was awesome. the pastor responded by saying he wouldn’t be struggling with the issue if he didn’t already know it was something worth struggling with. you would not be struggling with sin if the spirit of god wasn’t in you. keep struggling. our struggles are what make us. i can’t imagine what life would be like without struggles. i think it’d be pretty boring. for the past year i struggled with a lot of stuff, and as much as i hated going through it, it was worth it. for even longer i’ve struggled with my weight. i’d love to lose 30 pounds by the end of the month, but what i’m learning in my struggle with my weight right now is going to last me a lot longer than if i simply did a crash diet to get to my goal. life isn’t found in the end result. life is found in the struggle. i have a friend who is a pastor. he’s not the lead guy at his church but he’s asked to teach every couple of months. while he loves to teach, he always gets uncharacteristically nervous before he goes on stage. a few months ago i talked to him as he was preparing to speak and he gave me an insight into how he’s learning to trust his struggle. he said he’s finding when he gets on stage, he’s not going to be comfortable right away. he’s learning his teaching ability is completely centered around how focused he is on jesus during his sermon. if he can consistently trust jesus in the moment, he can deliver a good sermon. when he gets nervous or apprehensive and takes his eyes off jesus, he begins to sink and lose his delivery. he knows what his struggle is, and he’s beginning to trust it. what’s your struggle? what’s beating you up? what are you kicking around right now and how are you learning from it? whatever it is, you have a choice to make. you can choose to either keep fighting for the sake of fighting, doing the same things you’ve always done, or you can choose to trust the struggle. let the struggle teach you. let it show you something about yourself that you don’t already know. if you pay attention to whatever the struggle is, you’ll begin to see the path to turning it into an asset. it’ll change who you are. Thanks for sharing Jonathan! This is really good insight. One that spoke to me today. Thanks J. I know I said it on Twitter, but that means a lot.